Whisper Quiet Operation! Never run short of homemade jerky or snack sticks again with this high capacity food dryer. With ten chrome-plated iron trays and an immense 16 sq. ft. of drying area, you can make mountains of jerky, snacks or other dried delicacies in a single sitting. The horizontal air flow design is powered by a whisper quiet rear mounted 770 watt fan and heating system for uniform drying without waking up the neighbors. A twelve hour analog timer and adjustable thermostat lets you dry foods at just the right temperature and duration for maximum nutrition and flavor. Stainless Steel housing. ETL Certified. Make your own organic, all-natural snacks! 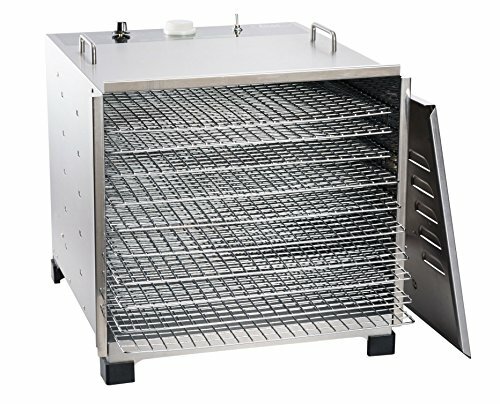 LEM Products provides a selection of food dehydrators that make food drying fun, fast and easy. Drying is a year-round and creative way to preserve fruits, vegetables, herbs, seeds, fish and meats. Food dehydrators eliminate safety concerns of drying foods in alternate ways. Fruits can be dried into chips or fruit leathers. Vegetables can be dried to make dry soup mixes, or even veggie leathers. Meats and fish can be dried into jerky. Use a food dryer for re-crisping breads and crackers. There are many advantages to drying and preserving your own food: Save money, make your own fruit or vegetable mixtures, control sugar content and eliminate additives found in most store-bought items. Dehydrating can be an alternative to canning and freezing, but also compliments these preservation methods. Snacks and treats for your pets are fun and easy to make. For the creative & crafty, food dehydrators are useful for: cake decorations, drying flowers (potpourri), dough art and even drying photographs. Choose the LEM Products Food Dehydrator that’s perfect for you: #1152 (5-Tray with Digital Timer); #1153 (10-Tray with Digital Timer); #1154 (Digital, Professional, Stainless Steel, 10-Tray) or #778A (Stainless Steel, 10-Tray with Timer).